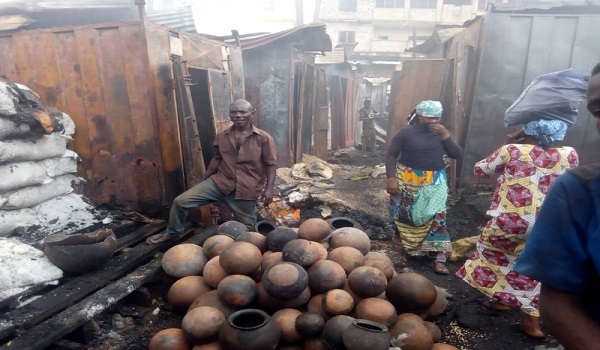 About 50 stalls have been gutted by fire at French line, an area within the Kumasi Central Market in the Ashanti Region. The fire started around 11:30 pm on Thursday, 25 October 2018 and swept through that part of the market. A swift response by firefighters to distress calls led to a quick control of the flames. Properties amounting to thousands of Ghana cedis have been lost. Corn mill machines, bags of beans, bags of pepper, rubbers, clothes, earrings, and others were burnt in the inferno. A traditional cuisine restaurant and drinking bar were also gutted by the fire. 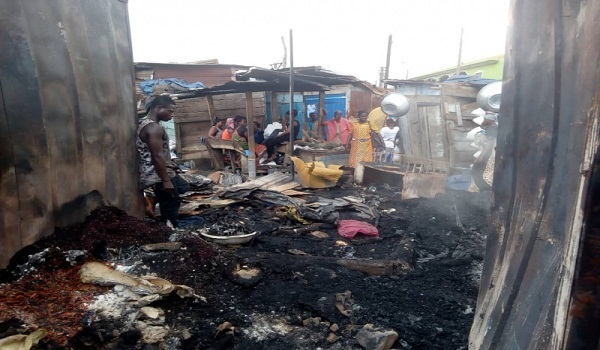 An eyewitness told Class News’ regional correspondent, Elisha Adarkwah that he heard an explosion on the overhead wires that connect the national grid to that part of the market before the fire started. The victims began to count their losses when they visited the scene Friday morning. They have pleaded with the National Disaster Management Organisation (NADMO) and other authorities to come to their aid.